Tariffs and trade wars are in the media almost every day at the moment. Many industries find themselves caught in an environment where they may be facing tariffs, from steel production over jeans, whisky, auto-motive, to even indirect products such as the costs impacts for Coca Cola of tariffs on the raw materials for their soda cans. 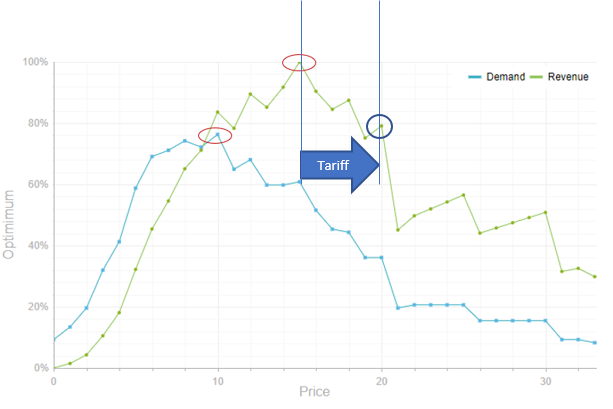 Using basic price research can help companies understand how big an impact tariffs can have on their future demand. Normally the revenue is optimized where the green revenue curve reaches its peak. But apply a tariff and move the price X% to the right from the optimal point. If no other action is taken and the tariff is 100% passed on to the customers represented in the demand curve, then it can be expected that in this case revenue will drop with the distance between the top red circle and the blue circle, approximately 20%. Having this kind of insight, both by overall market and broken down by various customer segments can help vendors understand the impact of tariffs and how much it makes sense to either pass on the tariffs to the customers, or to absorb some of those costs because the loss in revenue would otherwise be too big. As a side comment, tariffs probably make up some of the best arguments for a price increase, so top-tier marketing managers and pricing specialists should use this "opportunity" to implement some price increases. Many other price increases are met with considerably more resistance from buyers than those coming from tariffs. So exploit the opportunity, but know the short-term demand consequences.